* Eschscholzia californica - maintains the normal functioning of the central nervous system. Alkaloid contained protopin has a soothing, anti-inflammatory and hypotensive action, has beneficial effects on nervous irritability, anxiety and insomnia. * Withania somnifera - has beneficial effects on the central nervous system, endocrine and cardiovascular system. Supports physical and mental health. * Glycine - an amino acid that is involved in protein building glandular tissue and supports the nervous system. Recommended daily dose: 1-2 capsules daily, between meals. 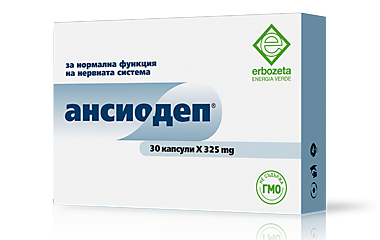 To improve sleep, take 2 capsules Ansiodep evening, one hour before bedtime.